Did you know that there are more than 4,000 miles of hiking trails in the Blue Ridge and Great Smoky Mountains? This includes trails along the Blue Ridge Parkway, in Pisgah National Forest, The Great Smoky Mountains National Park, Nantahala National Forests, Appalachian Trail, and other smaller parks and national forests? 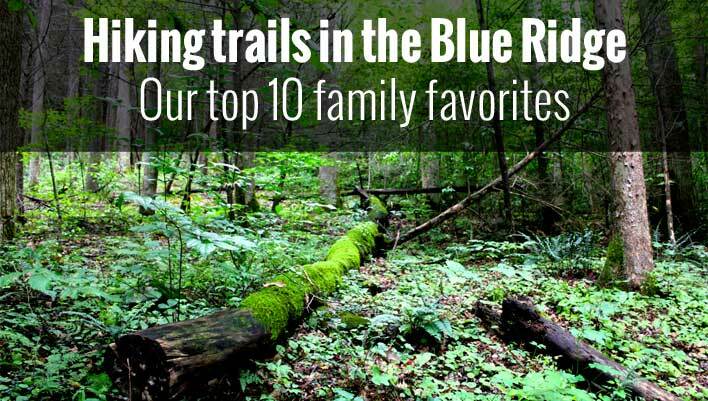 We’ve compiled a list of favorite trails based on our own personal hiking experiences, feedback from other experienced hikers, and based on other families we know. Our criteria? Directions: At the intersection of Highway 441 and Highway 321 in Gatlinburg, turn eastbound onto 321. Drive six miles and then turn right into Greenbrier (look for The Great Smoky Mountain National Park entrance sign located on the right). This road turns into a gravel road after a short distance, so don’t be surprised. Drive about three miles until you reach a fork in the road. Continue straight at this junction to reach the Porters Creek trailhead. The parking lot is another mile up the road. Porters Creek Trail is a short, relaxing and scenic hike. The trail follows Porter Creek past the Masser Farm site, Ownby cemetery, the Smoky Mountain Hiking Club Cabin and then finally Fern Branch Falls. Fern Branch Falls is easy to miss, so watch for it. If you enjoy wildflowers, the best time to hike this trail is during the spring where many different types of wildflowers blanket the forest floor. This trail is known for having one of the most beautiful displays of wildflowers in the national park. The early portion of Porters Creek Trail follows an old gravel road through and into a dense old-growth forest. The trail itself follows Porter’s Creek as it winds through the forest. Almost at the 1 mile mark, the trail will split. There are signs, but follow the trail to the left to the reach Fern Branch Falls. From this point, Porters Creek Trail narrows, and becomes more trail like, with rocks and goes into heavier forest. The trail also steepens a bit at this point and moves away from the creek some. At the 1.5 mile mark, you’ll reach a rail bridge. Once crossed, begin looking left for the falls. The falls are not marked, and often hidden with brush. Fern Branch falls cascades about 50 feet and can be extra beautiful after a hard rain. The trail continues on for another 1.7 miles to back country campsite #31 if you want a longer hike. Along the trail, you’ll encounter an old farmstead, including old walls, a cemetery, cabin, and cantilevered barn built around 1875. We definitely recommend visiting these sites while you’re there. Porter’s Creek trail is listed in a great book, History Hikes of The Smokies which provides for some interesting details about the trail and area. Directions: Directly off the Blue Ridge Parkway at milepost 422.4 in NC, between Asheville and Waynesville, NC. Just watch for the signs and large parking lot. The trail entrance itself is east of the parking lot up the parkway a little. The Devil’s Courthouse trail is located on the Blue Ridge Parkway, at milepost 422.4. The trail is short, but strenuous as the trail climbs steeply about a half a mile to the peak of Devil’s Courthouse. The trail is primarily paved all the way up, and begins at the large parking lot next to Devil’s Courthouse. The climb to the top is well worth it, as the view is outstanding. The summit offers views of North Carolina, South Carolina, Georgia, and Tennessee. The mountain and trail name comes from the devil like appearance the mountain itself has. Legend says that within a cave in the mountain, the devil himself holds court. Cherokee claim the save is a private dancing dancing chamber, and dwelling place of Judaculla, a giant that roamed the area. Local Cherokee have also told us that the mountain was used by Cherokee Indians for executions. Devil’s Courthouse is home to a number of very rare and protected plants, so please stay on the trail as you hike to protect the plants. Directions: Located on the Blue Ridge Parkway at milepost 418 between Asheville and Waynesville NC. There is a large parking lot for the area. Second Falls at Graveyard Fields from The Blue Ridge Parkway – See our Fall Color Guide. Graveyard Fields is just a short distance up the Parkway from Devil’s Courthouse, and is located at milepost 418.8 on the Blue Ridge Parkway. During the spring, summer and fall months this parking lot is often very busy and full. The trailhead at the parking lot is clearly marked, and begins with flight of stairs going down into a dense rhododendron thicket. The paved trail weaves it’s way through the thicket and ends at a wooden platform at Yellowstone prong. Many people stop here, find a comfortable rock and enjoy the beautiful scenery and the sounds of clear rushing water. While nothing wrong with that, but by not continuing on, you’ll really be missing out! From yellowstone prong, you can either go left to Upper Falls or right to Lower Falls, both are beautiful waterfalls. The Trail to Upper falls is about a mile, and the longer and more difficult of the two. Graveyard field is a wonderful hike that is very family friendly. Graveyard fields is one of our favorite places to visit during the summer both for hiking and swimming. >>> Read our Detail Write-up and see many more photos of Graveyard Fields on our Graveyard Fields page. Directions: On the Blue Ridge Parkway at milepost 451.2 between Waynesville and Maggie Valley, NC. Watch for the signs, and take the access road up to the Waterrock Knob parking area. Waterrock Knob is a popular area, located on the Blue Ridge Parkway at milepost 451.2. The Waterrock knob is the 16th highest mountain in the eastern US, and the 15th highest in North Carolina at 6,292 feet. The Waterrock Knob parking lot located on a short side road off the parkway. Waterrock knob features a large parking lot, Visitor’s center, and a 1.2 hiking trail that takes you from the parking lot to the peak. The Waterrock Knob trail is also the last trail on the Parkway, before it ends in Cherokee, NC at the Great Smoky Mountains National Park. Waterrock Knob gets it’s name from local hunters and farmers that would stop there to get water from a cool spring that flows over a “water rock”. Most people stop at the parking lot, and don’t take the trail, so the trail isn’t typically too busy. The parking lot itself offers some incredible views, some of the best on the Parkway, and the views from the trail, which goes even higher are beautiful as well. The Waterrock Knob parking lot is one of the best places in the NC Blue Ridge to watch both the sunrise and the sunset. Taking the trail offers moderate 1.2 mile roundtrip hike to the summit of Waterrock Knob, at 6,292 feet. The trail gains 412 in elevation, and while a bit steep is paved and easy to walk up and down. The trail ends a an overlook at the summit, and while not a 360 degree view, separate areas offer beautiful distant views. On a clear day, you can see up to 50 miles away. Waterrock Knob also includes views of Maggie Valley and Ghost Town. This is a great trail that is short, easy to hike, and offers some of the best scenic views on the Parkway. The trail is great for families, our kids have hiked this trail many times, both with us and with their church youth group. Directions: At the intersection of highway 441 and Highway 321 in Gatlinburg, TN, turn eastbound on Highway 321/73. Drive about 18 miles until the road dead-ends into Highway 32. Turn right towards Cosby, and drive 1.2 miles to the entrance to The Great Smoky Mountain National Park. Turn right into the Park and drive another 2 miles to the Gabes Mountain trailhead. The trailhead is on the right side of the road up from the the large Cosby Picnic Area parking lot. Hen Wallow Falls is located off the Gabes Mountain Trail. Hen Wallow Falls is located in The Great Smoky Mountains National Park and is one of our favorite hiking trails to do as a family. The hike is easy, except at the very end, and trail weaves it’s way though a hemlock and rhododendron forest. The reward for the 2.2 mile hike out (the trail is 4.4 miles round trip) is Hen Wallow Falls. Access to the falls is via the parking area at Cosby Picnic Area (near the entrance to Cosby Campground). To access Gabes Mountain Trail, Then backtrack on foot approximately 100 yards along the road to the signed start. Gabes Mountain Trail will take you to the small trail leading down the waterfall. Jenn and “the crew” ready to go. Hen Wallow Falls is a 90 foot high waterfall that starts at only 2 feet wide at the top and fans out to over 20 feet at the base. The falls are gorgeous, and make for a great place to stop and have a picnic. The base of the falls is very rocky with many small pools of water, making it a great location to find salamanders and crawfish. Our younger kids could literally spend hours here finding them. The roundtrip trail distance to the waterfall and back is 4.4 miles and takes about 3-4 hours, depending on how long you stay at the base of the waterfall. The trail contains many scenic points of interest, including small creeks, bridges and beautiful forest. We suggest tracking your hiking time out the falls so you know about how long it will take you to get back. Also, black bears are active in the area, so be be aware. This is not uncommon for any trail located in the Great Smoky Mountains National Park. Linville Falls is a very popular recreational area located off the The Blue Ridge Parkway at Milepost 316.4. You can’t miss the signs. The reach the parking lot, turn into the entrance, and follow the road about 1.5 miles to the parking lot and visitors enter. On the way in, you’ll also pass Linville Falls campground. There are two trails you can take from the visitors center. Both are clearly marked and shown on a large map next to the visitors center. The most popular trail is Erwin’s Trail, which leads you alongside Linville River with many different areas for wading. This trail leads to four different overlooks and is a 1.6 miles roundtrip. The majority of the trail is easy, with only a very small decline in elevation. The first overlook is of Upper Falls which offers up close and fantastic views of the “twin falls”. A little further down the trail you can see the water rush into a narrow area before plunging over Linville Falls below. The next overlook is called Chimney view and offers and excellent view of both upper falls and Linville Falls, as well as views of steep cliffs. If you enjoy taking photos, this is a great location. A little further down, the fourth and final view is Erwin’s View Overlook. This overlook provides and incredibly scenic and wide view of Linville Gorge and the falls as well. The trail up to this overlook is a bit more steep and goes from easy to moderate. The elevation here is 3, 330 feet, the highest in the area. Return to the parking lot along the same trail. The second trail, Linville Gorge Trail provides a more remote experience, and offers up close views of Linville Falls, cliffs, and natural forest. This trail is far less popular, and is the trail to take if you want to avoid the crowds. Linville Gorge Trail is strenuous, and due to large rocks requires hikers to be able to lift their knees to waist height in order to climb some of the rocks. The trail gets pretty steep in some areas as well. If you are physically able to make it though, you will be rewarded by outstanding views at the base of Linville Falls. There is no swimming in this area due to the strong currents. Like Erwin’s View Trail, your return to the parking lot is via the same trail. No loop trails at Linville Falls. We’ve been to Linville Falls a number of times and always makes for a great family hiking destination, especially along Erwin’s View trail. As previously mentioned though, Linville Falls is a very popular spot and is often very busy on the weekends, especially in the summer. We recommend trying to visit during the week if you can. If you do have to visit on the weekends, try to arrive early. The road to Linville Falls off the the parkway is closed during the winter. Directions:Take I-40 West from Asheville to exit 7 (Harmon’s Den). Turn right on Cold Springs Road. The road very quickly becomes gravel. Cold Springs Road climbs upward for 6.2 miles to Max Patch Rd (SR-1182). Turn left and drive 1.5 miles to the Max Patch parking area. Max Patch Mountain is a great hiking location and offers stunning high elevation views. The mountain makes for an excellent family friendly destination and wonderful picnic lunch trail. Max Patch Mountain was cleared in the 1800s and used for pasture. While you won’t get a great deal of forest, what you do get is clear, unblocked views of the Blue Ridge and Great Smoky mountains. Many of the views, especially at the summit are 360 degrees. There are two primary trails at Max Patch Mountain and 1.4 mile loop and a 2.4 mile loop. Both are easy and run across the top of the mountain. The 1.4 mile loop crosses over the summit close to 4,600 feet in elevation. The 2.4 mile loop trail goes around the mountain, offering wonderful views from all sides. From the parking lot, just follow the marked trails. You can also walk north or south on the Appalachian Trail which crosses through the area. Max Patch Mountain is a bit off beaten path, visiting on the weekends, it’s not very crowded, which frankly makes it really nice. >>> You can read all about our visit to Max Patch and see more photos in our detailed write-up. 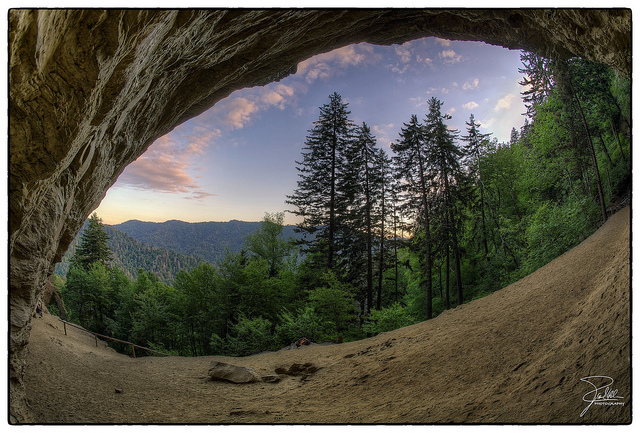 Alum Cave Trail is a popular hiking trail located in The Great Smoky Mountains National Park. The primary destination for the trail is Alum Cave, which really isn’t a cave by more of a concave shaped bluff or cliff. But you can continue on this trail all the way up to the summit of 6593-foot Mount LeConte. Some interesting history around he cave. The “cave” was used to mine Epsom Salt. The Epsom Salts Manufacturing Company was founded at Alum Cave in 1838 and was sold 1854. Epsom salt was used by surrounding mountain folk to dye homespun clothing and cure various ailments. During the Civil War the Confederate Army mined saltpeter out of the cave. Saltpeter was used to make gunpowder. Directly off of Newfound Gap Road in The Great Smoky Mountains National Park is the large parking lot for Alum Cave Trail. This can be a very busy spot during the spring, summer and fall, especially on the weekends. We suggest arriving early to get a parking place. The trail begins as a gentle climb up, following Alum Cave creek for the first mile or so. You’ll go through a dense growth of rhododendrons near the one mile mark. If you hike early in the summer, the rhododendrons are in bloom. At 1.3 miles, you’ll reach Arch Rock, the first main “feature” of the trail. The arch itself was formed by years and years of freezing and thawing that caused erosion. Continuing on the trail involves climbing a set of stairs carved into the raw rock of the arch. Next stop at the 2 mile mark is Inspiration Point, named for it’s stunning view. At 2.2 miles, you’ll reach Alum Cave. The cave is roughly 80 feet high and 500 foot long. The views from here are gorgeous and offer a number of photo opportunities for photographers. Craggy Gardens, just to the north of Asheville, NC on the Blue Ridge Parkway (beginning at milepost 364.1) is a very popular destination and is known for some of the most scenic views on The Blue Ridge Parkway. People visit from all over to see the breathtaking views, wildflowers, rocky crags, and Rhododendrons. Craggy Gardens gets it’s name from the combination of “rocky crags” and numerous Rhododendron and wildflowers that grow in the area. The most popular trail at Craggy Gardens in the Craggy Pinnacle Trail, which leads you to the top of the 5,892-foot summit for 360 degree views. The trail provides both excellent sunrise and sunset views. From the visitors center, continue north on the parkway, through a small tunnel and to the Craggy Pinnacle parking lot (Milepost 364.4). Look for the trail sign near the parking lot. Just follow the trail and you’ll eventually end up at a fork, where you can either visit the summit of the lower overlook. We recommend both! The summit overlook offers views of Mount Mitchell, Asheville’s water reservoir and views of the parkway itself. The Craggy Gardens Trail can be accessed from two separate locations: The Visitors Center and from the Picnic Area. The Craggy Gardens trail is a nature trail that has a moderate uphill climb for .3 miles to a trail shelter if you begin at the Visitors Center and .8 miles uphill if you begin at the Picnic Area. The trail shelter makes a great spot for a picnic. The shelter is nearly a century old! Regardless of where you start, this trail will take you on the famous Mountains to Sea trail, which leads all the way from the NC Blue Ridge Mountains to the Outer Banks of NC. The Douglas Falls Trail at Craggy gardens is one of two trails that will take you to Douglas Falls a 70 foot free falling waterfall. The roundtrip hike to Douglas Falls from Craggy gardens is 8 miles and not for the inexperienced. The hike is steep, remote and takes you through some very wilderness areas. A shorter hike to Douglas Falls is accessible further up the parkway. Directions: Take I-40 west from Asheville approximately 50 miles to first exit in Tennessee (exit 451). At the stop sign, turn left under I-40, then right and cross the bridge. Continue down this road, past CP&L generating plant.. You’ll see lots of rafting in the river during the summer. The pavement will end and you will continue on gravel road to a 4-way stop. Go straight entering The Great Smoky Mountains National Park. Continue 1 mile to the parking lot, with picnic areas and rest rooms. The Big Creek area of The Great Smoky Mountains National Park is just plain gorgeous. Hiking on Big Creek Trail, you’ll cross through old growth forest, and follow alongside Big Creek, which is full of huge boulders and rushing water. The hike up Big Creek Trail is a gradual climb that follows an old railroad grade that was used for logging in the area. Big Creek Trail is an easy hike that leads to not one, but two “rewards”, Midnight Hole and Moose Creek Falls. Midnight Hole is a deep water area of Big Creek that is surrounded by large boulders. Midnight Hold is located about 1.4 miles up Big Creek Trail on the left. Midnight hole is one of the more popular “swimming holes” in the park and during the summer is often busy with kids and adults wading, swimming and even plunging into the deeper areas from the large surrounding boulders. Mouse Creek Falls is on up Big Creek Trail another .5 miles up Big Creek Trail, and well worth the extra walk. Mouse Creek Falls is a 20′ tall waterfall, that cascades over moss covered rock, and then falls another 15 feet into Big Creek. A very pretty falls, and easy to access. You’ll often find people here during the summer at the base of the falls playing in the water. Directions: Take I-26 West from Asheville, NC towards Johnson City, Tennessee. Follow Highway 107, 173 and US 19E to the town of Roan Mountain. Take a right on Tennessee State Road 143, and follow the signs for Roan Mountain State Park. I know, I know, I said 10, but there was one more I just had to mention, Roan Mountain. Roan mountain is located on the North Carolina and Tennessee border. Roan mountain isn’t actually just one mountain, but a ridge that runs more than 5 miles long. Roan is famous for Famous for its Catawba Rhododendron with their brilliant purple flowers in spring and it’s nearly 360 degree views in many places. Roan mountain is also one of the tallest mountain ranges in the Southern Applachians at over 6200 feet. The primary hiking trail at Roan is the Appalachian Trail, which travels along the ridge tops . There are also a few other trails in the area, including one fully wheelchair-accessible trail through the main Gardens area. In our opinion, the best hiking is at Carver’s Gap, the first Roan location you’ll come to. The Carver’s Gap area offers nearly 7 miles of grassy bald. From the Carver’s Gap Parking lot, you can access the Appalachian trail, heading in either direction. You can hike for several miles across Round Bald, Jane Bald and Grassy Ridge or go the other way to Roan High Knob and Roan High Knob shelter. Roan High Knob shelter is the highest backcountry shelter on the Appalachian trail. Be prepared, at this elevation, weather can change rapidly. The views and scenery in either direction are stunning. The recreation area contains three different hikes. The recreation area is on up the road, past the Carver’s Gap parking lot. Access to the recreation area costs $3 at the time of this writing. Both the .3 mile loop trail and the longer figure 8 trail are mostly nature and flower trails, where you will see lots of wildflowers and rhododendrons. Cloudland Trail is a moderate hike that is about 1.2 miles in length that takes you out to the Roan High Bluff Overlook which offers a nice deck, with stunning long distance views. Allow plenty of time to complete your hike. The average hiker travels about 1.5 miles per hour. Plan for that speed or even slower. Download a trail map, and read up on the trail before your hike. When hiking, stay on the trail. Wear comfortable clothes, and plan for the expected weather conditions. Wear comfortable hiking boots or hiking shoes. Tell someone not traveling with you where you are going and what time you will be back. Do not hike alone, always hike with at least one other person. Always bring a flashlight with you, just in case. Expect you will encounter wildlife, including bears, poisonous snakes and stinging insects. Most of the time you won’t, but be prepared. Bring a small first aid kit with you – We like this one from Lifeline at only $12.00. The kit is lightweight and perfect fitting in day trip backpack. Thank you Linda. We’re ready to get hiking too, can’t wait until the weather warms up enough! I think our first trek is going to be out on Alum Bluff Trail. If you try any of them, let us know what you thought of the trail. Thank you so much for the article/ advice! We plan to travel to these areas a few times this year and will definitely be referencing this article and checking out a few of these trails. Hey Debra, you’re very welcome. When you check them out, let us know what you think. Happy Hiking! Wow! Loved the pictures and the local-knowledge flavor of the write-ups. Very helpful. Do you offer any of these photos as prints? I am interested in a large print of Roan Mountain. It is just what I’ve been looking for. My size requirement is large (to fit an existing frame) at 36″ high by 44″ wide. To get the height requirement in, the width could be trimmed as necessary. I have a stretcher frame, so just the print on canvas is all I would need. BEAUTIFUL photograph capturing my beloved mountains AND the flowering rhododendrons. If not, could you point me in the direction of where I can find a similar print? My area of interest is in the north western corner of NC (and surrounding areas of TN and VA down to Asheville area). Any chance you could put together a hiking guide for seniors in our region? Trails with no more than 500 to 1000 FT elevation gain not too strenuous. three, four, or five miles round trip?